Short bursts of writing can boost English language learners' confidence and skills. 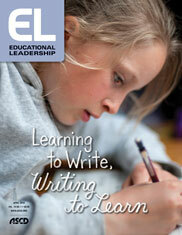 English language learners (ELLs) don't always have to produce long pieces of writing to increase their proficiency. They can practice important writing skills and improve their confidence as writers by doing shorter bursts of writing. These shorter writing opportunities are called "micro-writing" or "quickwrites" and are supported by the Common Core writing standards, which note that students should devote both short and extended time frames to writing. Even if your state has not adopted the Common Core, it's likely your standards have similar expectations. I define "micro-writing" as a task that takes 3–10 minutes. I generally combine micro-writing with a short sharing activity afterward (such as small groups of students reading what they wrote) to reinforce listening and speaking practice. There are many benefits to this practice, including its application of what researchers have dubbed The Progress Principle—the finding that people are most motivated by experiencing everyday progress, no matter how small. What follows are some ways you can use micro-writing with your ELLs (or any student, for that matter) and resources that support the practice. As educators, we know it's important to help students connect their background knowledge to new information and concepts. Research specifically with ELLs finds that activating and building prior knowledge plays an influential role in improving their academic literacy across content areas. Its impact can be seen in everyday classwork and in formative and summative assessments. Prior to starting a thematic unit on holidays with my beginning English language learners, I shared images from around the world of people celebrating Christmas, Rosh Hashanah, and the Islamic holiday Eid al-Adha. I then asked students to write or draw (if they didn't know the necessary English words) for five minutes about a holiday important to their culture and something they thought they knew about a holiday from a different culture. After writing and sharing, not only were students ready to engage in subsequent lessons, but they were also able to quickly clear up some misconceptions students had about different holidays. Reflecting after a lesson is just as important as activating students' background knowledge before a lesson. Reflection can help students apply what they have learned in school to another context outside of the classroom—which is, in many ways, the primary goal of education. When I was a boy on the farm in Illinois there was a great deal of timber on the farm which we had to clear away. Occasionally we would come to a log which had fallen down. It was too hard to split, too wet to burn, and too heavy to move, so we plowed around it. In other words, there are some battles not worth fighting. I told this story to my U.S. history class of ELLs when we were learning about the Civil War. I asked my students to write about something in their lives that they could connect to that story. Students shared examples of handling tensions with parents and teachers (among other stories), and we then had a lively discussion about how to determine when something is worth fighting for and when it is not. Finally, I will often ask students to write a few quick sentences sharing how what we learned in the day's lesson might come in handy sometime in their future lives. In one recent study, researchers had students write one paragraph after a lesson sharing how they thought what they had learned would be useful to their lives. Writing several of these quick-writes during a semester led to positive learning gains, especially for those students who had previously been labelled "low performers." Another way to promote greater understanding of key concepts is to have students explain in their own words—to others or to themselves (called "self-explanation")—what they are learning. Substantial research has shown that this type of explaining helps students identify their incorrect assumptions and generalize concepts for future applications. Our school recently administered the PSAT to students, including ELLs at the early-intermediate level and higher, to measure college readiness. A few days prior to the test, my students explored an interactive feature from the New York Times to guess the unemployment rate for people who hold a bachelor's degree compared with those who graduated only from high school. I then shared the accompanying article that described the differences in more detail and asked students to write why they thought those differences existed. I like to think this activity resulted in greater motivation on test day, but, of course, this kind of "self-explanation" quick-write can be used after learning anything new from a lesson. Traditional reading strategies like making a prediction and asking a question are obviously important for students to practice. Although not all reading strategies are ideal to use in micro-writing, summarizing is one that lends itself well to the practice after students have read a text or watched a video. For instance, my U.S. history students were studying the missions in California. They were researching for an essay about whether the missions' founder, Father Junipero Serra, should have been named a Catholic saint. I read aloud portions of articles that reflected both stances that students could take—some from supporters of Serra and others citing Native American objections. In a series of micro-writing assignments, students summarized the articles. They later used those summaries when they wrote their final essays. Plot Twist: Choose a part of the book you have read and explain how you would change the story. Why would you make this change? Dear Diary: Pick a character from your book, and write an entry in his or her diary. Rename it: Write a new title for your book. Explain why you chose this title. What if? : Write a question about your book that begins with "What if?" (for example, in The Hunger Games, "What if Katniss didn't volunteer as a tribute?") and then write a response to your question. The New York Times Learning Network's series "What's Going on in This Picture?" is an ideal source to turn to when you want to show students images and then have them write to an accompanying prompt. For example, in viewing a photograph of a protester being arrested by police, one ELL student wrote: "I see police take away woman. She want justice. It danger to do this in my country." How do you think the person who took the photograph felt at the time? Why? Imagine a conversation between two or more of the people in the photo. What would they say to one another? What do you think each of the people in the photo are thinking, and why? If the image included areas outside of the frame, what else would you see? Why do you believe that? How does this image remind you of experiences you've had in your life? I think the most interesting thing about Mexico is ___. The author of our textbook said on page ___, "___." This would be interesting because ___ (or "This reminds me of ___). Students then recopied their completed sentence frames into paragraph form, shared their paragraph with classmates, and used peer feedback to make improvements. For other micro-writing ideas, refer to my collection of downloadable examples of writing frames and structures. Writing practice through micro-writing won't "make perfect." But, combined with peer and teacher feedback, opportunities to share with classmates, and plenty of time for thinking, micro-writing can boost students' writing, reading, speaking and listening skills in English. Larry Ferlazzo teaches English language learner, mainstream, and International Baccalaureate classes at Luther Burbank High School in Sacramento, California. His latest book, co-authored with Katie Hull Sypnieski, is The ELL Teacher's Toolbox (Jossey-Bass, 2018). Hull Sypnieski also contributed ideas to this article.